SYRACUSE, NY — Story, Photo and Audio by Race Chaser Online New York Correspondent Steven Ovens — Bobby East’s mission was simple on Saturday at the New York State Fairgrounds on Saturday- win the race and put yourself into position to win the USAC Silver Crown Series title. There was one problem though for East and his name was Kody Swanson. Swanson who had already won 4 events in 2014, made a great pass on East with 11 laps to go in Turns 1 and 2 after East slipped up high on the racetrack. 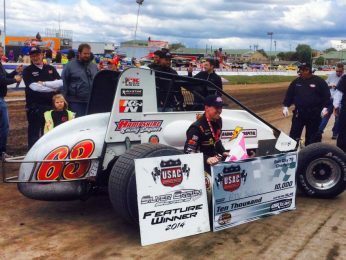 Swanson would go on to win the Salt City 78, but more importantly wrapped up the USAC Silver Crown Series championship with the win in the season-ending event. Swanson led the first 12 laps before East would make his way by him on Lap 13 to take the lead. East would take a large lead through the middle portion of the race, having nearly a straightaway lead on Swanson with 20 to go. Swanson kept trimming the lead and trimming the lead until he had finally caught East with 12 laps to go. Slower traffic had allowed East to get some separation, but with 11 laps to go East slid high in Turn 1 and Swanson filled the gap to take the lead out of Turn 2. Swanson would go on to score the victory over a strong and consistent A.J. Fike, East was 3rd, Chris Windom was 4th and Stewart Friesen completed the Top 5 in his first USAC start on the Moody Mile.